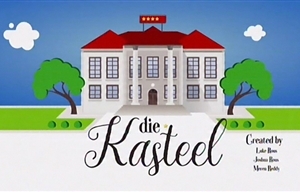 Die Kasteel (The Castle) is a South African, Afrikaans-language television sitcom which follows the misfortunes of the hapless staff of a boutique hotel in Pretoria who have no idea how to run such an establishment. Eckhard (Hannes Muller) and Tina-Marie de Wet (Dorette Potgieter) own a mansion in Waterkloof, Pretoria. Six months ago, Eckhard, stupidly invested in a Ponzi scheme that went under, causing them to lose everything - except their mansion. Since then, the couple have converted their house into a boutique hotel. Now - with help from their airhead daughter, Michelle (Cintaine Schutte), their naive gardener, Wilson (Solomon Cupido), and their sarcastic domestic worker, Cecilia (Pulane Sekepe) – the couple have to host colourful guests, week after week, in the boutique hotel known as Die Kasteel. Die Kasteel is an M-Net Original Production, created and produced by Luke Rous, Joshua Rous and Meren Reddy, for Rous House Productions. Reddy is the head writer and Joshua Rous is the director. The supervising producer for kykNET is Tina Kruger. A new true crime series starts on IDx, Potomac housewives do 1Magic and Moshe Ndiki asks "Uyang'thanda Na?" on Mzansi Magic.